Second messengers are the molecules which receive and pass the signals from receptors to target molecules inside the cell. Cyclic adenosine monophosphate (cAMP) and cyclic guanosine monophosphate (cGMP) are prominent second messengers in the brain. They are involved with diverse biological responses occurring in the brain. These two molecules are components in the signal transduction pathway which can amplify the strength of the signal and transfer to the target cells. Upon receiving a signal by the receptors, the concentration of these molecules in the cell increases and leads to the alteration of one or more enzymes in the cell. The key difference between cAMP and cGMP is that cAMP is synthesized from the ATP by adenylyl cyclase and cAMP synthesis is stimulated by the activation of G proteins in the cell membrane while cGMP is synthesized from GTP by guanylyl cyclase and is activated by nitric oxides. Cyclic adenosine monophosphate (cAMP) is a second messenger that is essential for many biological processes occurring in the cells. It is a cyclic nucleotide derived from ATP. It is hydrophilic in nature. 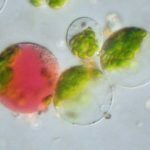 cAMP is used for intracellular signal transduction in many different organisms. cAMP synthesis is catalyzed by the enzyme called adenylyl cyclase in the cell membrane. 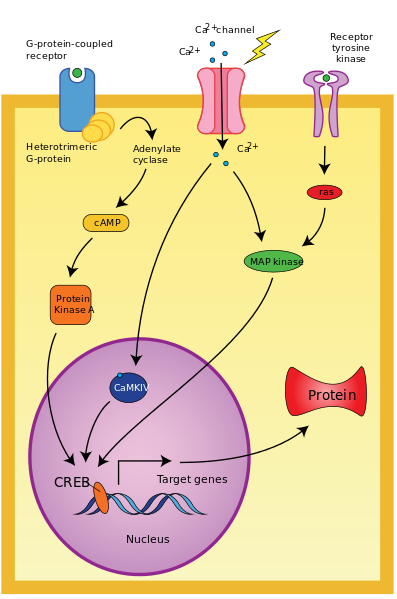 cAMP mediates the signaling pathway which is coupled with G proteins in the cell membrane. When a signaling molecule binds to the receptors of the G protein, it activates and induces the adenylyl cyclase enzyme. Then the enzyme converts ATP into cAMP in the presence of Mg2+ ions. cAMP mediates the signal transmission by acting as a second messenger between G protein and target molecule. cAMP is capable of amplifying the signal strength and activating different protein kinase A enzymes in the cell. This cAMP-dependent pathway is important for many living organisms and many cellular processes. It is also known as G protein-coupled receptor-triggered signaling cascade. After the signal transmission, the removal or degradation of cAMP occurs as it is not required further. Most commonly cAMP converts into 5′ AMP by phosphodiesterases in the cell. Cyclic guanosine monophosphate (cGMP) is another type of a second messenger found in cell signaling pathway. It is a hydrophilic molecule derived from GTP. cGMP synthesis is catalyzed by the enzyme called guanylyl cyclase in the cells. cGMP acts as a second messenger in cell communication mostly by activating intracellular protein kinases. 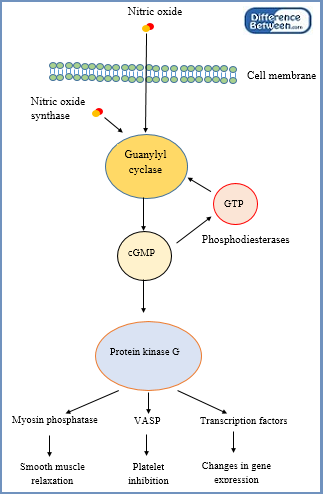 In response to a signal (nitric oxide or membrane impermeable peptide hormone) guanylyl cyclase converts GTP into cGMP to activate protein kinases. This process is known as cGMP-dependent pathway and it is not common like a cAMP-dependent pathway in cells for signal transmission. cGMP is converted back into GTP by phosphodiesterase enzymes and removed from the system. What is the difference between cAMP and cGMP? cAMP is synthesized from ATP. cGMP is synthesized from GTP. Synthesis is catalyzed by adenylyl cyclase. Synthesis is catalyzed by guanylyl cyclase. This shows higher concentration in most tissues compared to cGMP This shows a lower concentration in most tissues. cAMP and cGMP are hydrophilic cyclic nucleotides important in cells as second messengers in cell communication. These molecules receive and pass signals from receptors to target molecules inside the cell. cAMP and cGMP are more prominent in the brain and involved with diverse biological responses occurring in the brain. Both are able to regulate the activity of neurons, control metabolic processes, facilitate chemical and electrical signaling cascades, etc. They are also capable of activating ion channels and several protein kinases. The difference between cAMP and cGMP is that cAMP is a derivative of ATP while the cGMP is a derivative of GTP.